Helix Jump - Download and Play Free on iOS and Android! The word fall has such negative connotations these days. No one likes to fall from grace, glory, respect or a flight of stairs after all. However, that's about to change, because in Helix Jump, you're about to learn that falling is the greatest thing you could ever possibly do! Fall to the Ends of the Earth! The goal is simple. You control a bouncy little ball at the top of a spiral-shaped tower labyrinth, and you have to guide it all the way to the bottom. The simplicity ends there, for every tower is a hazard-ridden domain threatening to end your journey prematurely, and the only thing you have on your side is the ever-fickle mistress of gravity. 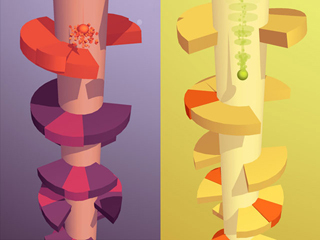 Conquer hundreds of winding and spiraling towers. 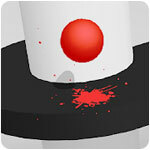 Use the touchscreen to spin the tower and guide the ball down to its lowest depths. Watch out for trap zones. If you land on these, it's game over! Be on the lookout for walls and moving ramps that will really mess up your day. Fall longer and greater distances to earn more points and shatter platforms. Do you need a little more speed in your daily routine? Do you want a little something to get the adrenaline flowing in your veins? If so, then you have come to the right place, because this is the app for you. Take the plunge and get it now! Simplicity has always been the name of mobile gaming. That is not necessarily a bad thing, as it has led to a whole industry of titles that anyone can pick up and play on most any mobile platform, and enjoy in a short amount of time. However, Helix Jump is an app that really takes simplicity to a whole new level. If the title doesn't explain everything in and of itself, then just taking a glance at the game in motion most assuredly will. The end result is actually a pretty fun game that has a solid foundation, but still needs a little something to realize its full potential. How simple of a game are we talking about here? It's as simple as falling down a spiraling staircase. Okay, maybe that's not the most apt description to use, but it gets the basic idea across, particularly in terms of looks. Your job is to guide a ball down a tower riddled with discs that serve as platforms. By moving your finger left or right on the touchscreen, you are able to rotate the tower, and in doing so, you navigate your descent, weaving through the gaps in the platforms until you hit the bottom. However, the trip down is not smooth sailing. Every tower is marred by brightly colored areas that serve as traps; touching them ends your journey immediately and forces you to start over again. With that in mind, wouldn't the obvious solution be to scale down the tower slowly and cautiously? If that's how you want to play, then yes. However, this game has ways of encouraging you to play more adventurously. If you allow the ball to fall a greater distance without landing on anything, some interesting stuff happens. For one thing, you get more points. For another, the longer the ball stays in freefall, the more it starts to resemble a meteor burning up in the atmosphere. Destruction ensues the second that ball of fire hits something and it won't matter if it slams into a safe zone or a trap; the whole disc will blow up and your descent will continue regardless. Like everything else about this game, it's a simple enough mechanic, but it manages to turn what would have likely been a slow-going drone into a fast-paced time waster. Prolonging a drop may be risky, but watching the points rack up as your ball catches fire and roasts whatever it collides with is very satisfying. However, if it results in too many failures, or you begin to fear you're biting off more than you can chew, you're always free to revert to a more conservative play style. It may not be as exciting, but it's more likely to get you to the next level. The visuals of your ball catching fire and destroying platforms are enjoyable, but they don't end there. Most everything about how this game looks is just oddly pleasant. Why that is the case is a bit difficult to explain. Maybe it's due to the colorful graphics and how the almost checker-marked landmasses of the towers evoke a kind of nostalgic feeling for old games from the '90s. Maybe it's all the odd quirks this world displays that gives it personality, like how the ball leaves splatters wherever it bounces as though it were made of paint, or how platforms above it collapse without warning. Perhaps it's how fluidly everything flows and transitions together. Whatever the case may be, this is a pleasing app to look at. 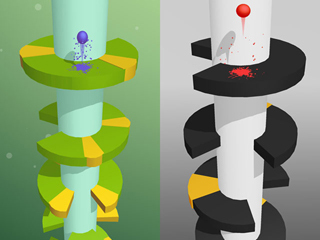 It's sometimes hurt by the occasional level riddled with hard-to-see traps, but overall, there are few complaints to say about the app's visuals. Unfortunately, as good as the visuals are, and as fun as the app can be at times, the elephant in the room is that there's just not enough meat to be found here. The gameplay loop is always the same. Sure, it gets progressively tougher, but you're still more or less doing the same thing as you bounce from tower labyrinth to tower labyrinth. There's nothing to unlock or earn, there are no fancy powers to unleash, and there's no multiplayer to add a competitive edge to the package. There are hundreds of levels to beat, but how much can you really take before you get sick? That's a question that haunts this app from beginning to end. The game's greatest strength and weakness is its simplicity. On one hand, its mechanics are easy to grasp and flexible enough to allow you to switch between careful and reckless gameplay on the fly. On the other, it's very repetitive. By all means, give it a shot, but keep your play sessions short if you want to avoid boredom.